Plus Walking Tour of Venice as you please with your expert tour guide. 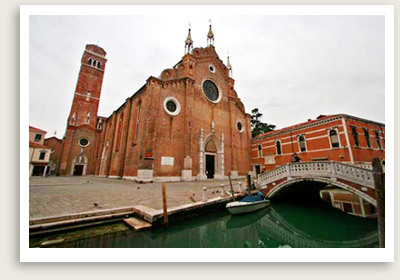 NOTE: We will customize your private tour to include a part of Venice you would like to visit. Includes: Roundtrip transportation from the dock in Venice, service of a private guide, entrance tickets to Frari Church & Scuola of San Rocco. All our private shore excursions from Venice’s ports can be fully customized for families, couples or private groups. Your guided shore excursion in Venice starts at the Frari campo (square), where you will see the mark left by various foreign communities who lived here through history. Inside the Frari Church, you can retrace the history of Venice and admire Italian art from the 13th to the 19th century. Here you can view original masterpieces by Giovanni Bellini and Titian. Then, around the corner, you will enter San Rocco Square, where you can visit the site of the celebrated San Rocco brotherhood, adorned with Tintoretto’s masterpieces dating from the late Renaissance. Going towards the Rialto area, you can visit the atmospheric San Giacomo dell’Orio Square and Church, whose wooden ceiling resembles a ship’s keel. After your guided tour of the Frari Church and Scuola of San Rocco, you will have 2 or 3 free hours to explore on your own. We can make arrangements for lunch, shopping, sightseeing and other activities you are interested in. Your Venice tour guide will meet you again after your free time and be with you for more touring until it’s time to head back to your ship. You will also enjoy a walking tour of lively San Polo, located in Rialto, the commercial center of the Republic of Venice. Your private tour guide will tell you about the foreign merchants that came here from far and wide to sell precious products like fabrics and spices. Today, you can still visit the outdoor fish and produce markets. The guided tour continues through the narrow, winding back streets to reach San Polo Square and its ancient palaces. From here, you will reach the Frari campo (square) with its magnificent church, where you can admire masterpieces by Giovanni Bellini, Titian and other artists. Your free time follows after your time with your tour guide. After your free time, you will meet your private boat for your return to the ship.